Vehicle Square Footage: Depending on how large the vehicle you are looking to wrap is there will be a difference in cost. This one is a no-brainer, but definitely a major factor in the overall price of your wrap. The larger the vehicle the higher the price. Not to worry though, we have different types of wraps ranging from full to several partial wrap options. So, if you have a larger vehicle, there’s nothing that says you have to wrap the whole thing. Vehicle Complexity: Simply put, some vehicles are more complex than others. That being said, some vehicles require some additional TLC. Vehicles that have more simple edges and flat surfaces don’t requires as much time as vehicles with rounded and complex surfaces do. 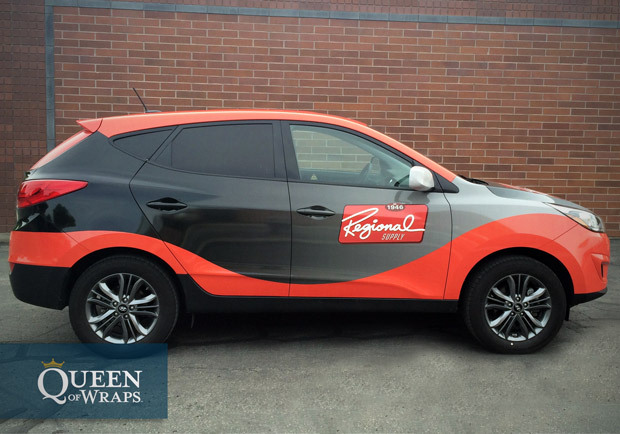 Chosen Wrap Material: There are many different types of material that can be used to wrap a vehicle and Queen of Wraps uses premium vinyl, built to last and withstand the elements for as long as possible. The quality of the wrap that you choose will effect the longevity of your wrap as well as the price. Coverage (Windows and Roof): If you’re looking to cut some costs on your vehicle wrap, not covering the roof and windows of the car will help save some square footage. This option doesn’t allow for as much room for your branding and message, but is definitely a viable option. At Queen of Wraps, we help you break down the pricing with three different categories. The prices below illustrate a starting price point, and each category is subject to all of the variables discussed above. Call us today to discuss your vehicle wrap options and receive a FREE quote!